Surround sound pan controller for Avid Pro Tools™ and Apple Logic Pro X™. Provides hardware controls for all Pro Tools surround parameters – panning, divergence, centre channel level, etc. For users of the Steinberg/Yamaha Nuage system, the JLCooper Nuage Surround Panner is also available; the controller is designed to fit directly into the Nuage Console expansion chassis. Full video and text review. The JLCooper AXOS Panner is a hardware panning controller designed to aid and automate surround sound production in Avid Pro Tools. With the addition of a JLCooper plug-in, the AXOS Panner can also be used to program surround panning automation in Apple Logic Pro, Steinberg Nuendo or Cubase. Compatible Pro Tools versions are HD 8, 9, 10 11 and 12. (Note that non-HD versions of Pro Tools do not support surround sound formats.) Logic compatibility is with Logic Pro X.
Physically, the AXOS Panner is an elegant and compact free-standing control unit connected by a single USB cable to the DAW host. DC power is via the USB connection. The AXOS Panner is very simple to install and will automatically configure itself for use with your DAW on initial connection with either Windows or Mac OS X. The control surface comprises a touch-sensitive joystick panner, five dual-function rotary encoders and a set of nine tactile push-buttons: the specific function of each control is determined by the DAW in use. 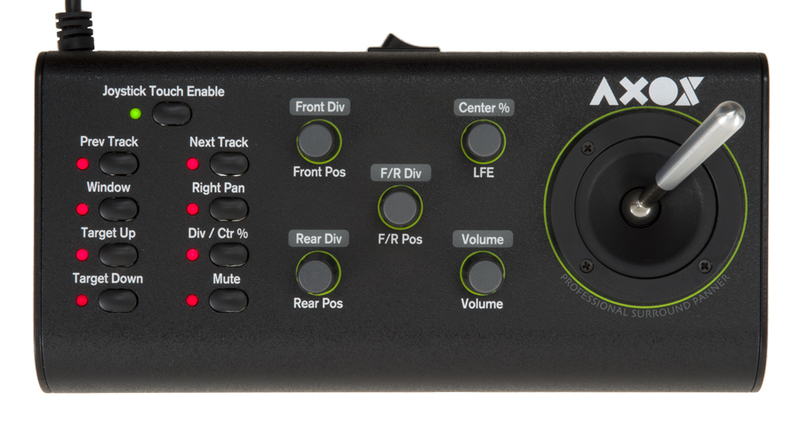 In addition to dynamic panning of the track(s) to which the AXOS Panner is assigned, the control set allows the mixer to adjust front and rear positioning, front-rear panning, LFE and C channel contributions, and front and rear divergence. Control of master volume and mute are also provided. When used with the appropriate JLCooper AXOS Panner plug-in, fully automated surround panning is available in Logic Pro X, Nuendo and Cubase. Tracks may be panned around the surround space, their movements being recorded in the DAW. Subsequent replays will reproduce the pan effects.